I’m honored and thrilled to share these stories with you throughout each day of 2015. This is an exciting and frightening adventure for me, for several reasons. First, these stories are personal. I don’t mean that they are based on real experiences – what I mean is this: Each story is derived from some fear, or hope, or intuition that I pondered and considered at some point in 2014. I don’t know how some readers will respond to these stories, and that frightens me. Second, some of these stories deal with ugly, harsh, or uncomfortable subjects. Not all of the stories are like this (Many of them are fun, humorous, and amusing thoughts on life), but some of them include characters that employ harsh language or twisted views on reality. My intention of including these subjects in my stories is not to glorify these things, or because I like these subjects, or because I agree with these characters. In fact, my intention for including them is the opposite. My intention for these stories is that they will reveal some element of truth about reality or human nature, and make you (the reader) contemplate the meaning underneath them. And I believe that at times, the truth can be revealed more accurately when these harsh, uncomfortable subjects are not ignored, but rather, are exposed. Lastly, I’m excited to share these stories, because they are a journey that I took. They are a small glimpse of each day of 2014. My favorite part of writing these stories has been hearing the response from the readers – What resonated with them, and what emotions they evoked. I invite you to be in touch with me, send me an email at astoryeachday@gmail.com or send me a message on Facebook, whenever one of these stories impresses on you or provokes you. 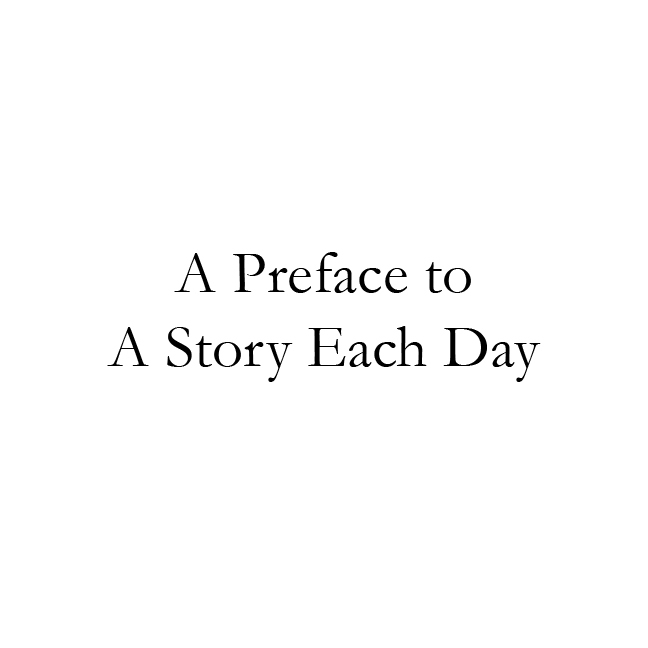 Although I’ve completed a years worth of stories, this is the beginning of these stories lives – I’ve considered the possibility of adapting the most loved stories from A Story Each Day into a series of short films. The extent of that will remain to be seen, but I know that some of these stories will live on, beyond the confines of this project or this website. I can’t wait to share them with you.